It is designed to meet the basic environmental knowledge that the sub-contract chain is required to prove to major contractors, and covers the environmental aspects of the new Health, Safety & Environmental touch screen test. The course will bring you environmental and sustainability knowledge up to date by giving a thorough overview of the subject, relevant legislation and industry best practice. It will enable you to identify, control and minimise the environmental impacts of your work and where possible identify environmental improvement opportunities. There are no formal entry requirements for this course, however, it was developed for construction supervisors and this should therefore be considered before enrolling delegates on to this course. 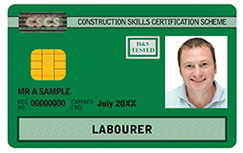 Valid for 5 years – to remain certified in this area, you will need to retake the course before the expiry date. Assessment will be by multiple choice questions at the end of the course. It is also expected that delegates interact during the course. The examination demonstrates to external bodies that the certificate is only awarded to successful delegates following both an assessment and examination.